The beginning of the history of honey is placed in ancient times, when honey was a widespread nutritional element and back then the only sweetener, since sugar started being used during the 18 century. Scientific studies have proved that despite their same origin, i.e. 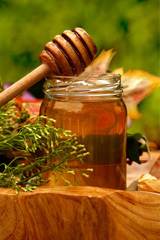 the vegetable juice, honey is healthier than sugar, since it is a biological product made by bees. It is a natural food that consists of over 180 components and is not subject to any chemical or industrial processing and therefore remains pure and natural. 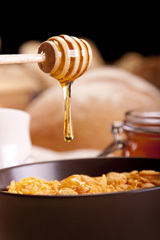 The basic ingredients of honey are sugar, monosaccharides (glucose, fructose) and a lower percentage of polysaccharides and disaccharides (sucrose). This high sugar level makes honey a fine and necessary source of energy for the body, suitable for athletes, pregnant women and children. Unlike sugar, honey’s ingredients, such as fructose and glucose, are absorbed very quickly by the body and help in the smooth functioning of the endocrine glands, as well as the defective metabolism and generally maintaining good body condition as it is energizing and calming. It consists of vitamins such as B1, B2, B4,B5, B6, C and minerals such as potassium, calcium, chloride, sodium and magnesium, components necessary for a balanced functioning of the cells, the structure of teeth and bones and good blood and muscles. Furthermore, trace elements, enzymes and organic acids complete the picture of a fully healthy and necessary for the welfare of the organism, nutritional element, which is honey. Many have come to appreciate the high nutritional value of honey, especially when compared to that of sugar, whose widespread consumption is mainly based on habit rather than conscious choice. 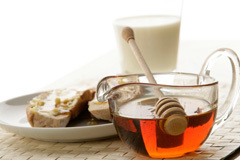 Nevertheless, due to honey’s rich flavor, unique aroma and golden color, it is constantly gaining loyal followers, who consciously choose to introduce honey to their diet and enjoy its great benefits daily.